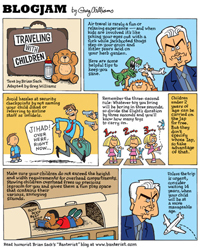 Greg Williams at the Tampa Tribune illustrated one of my pieces on traveling with children which is exactly what I’m doing right now. In Poland. Where the wheat is sharp. Did you know wheat is sharp? I did not know this. I have a bloody finger.